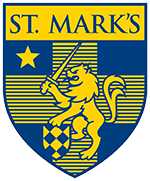 access the latest St. Mark's news, photos, and videos. Log in to your account and click your son's tab. If you have more than one son, roll over "Children" and click your son's name. Your son's schedule and grades will appear for the current school year. To view previous years, click the "Select Grade" dropdown menu. Click the link corresponding with the desired trimester. 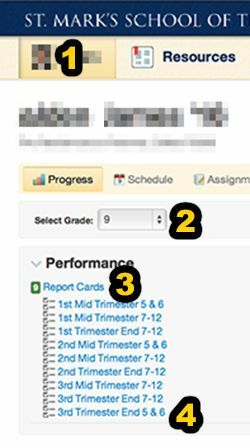 For students in grades 7–12, each trimester will show two report cards: "7–12" will display their letter grades and "5&6" will display teacher comments. Information regarding your son or, if you have more than one attending St. Mark's, you'll find them grouped under the "Children" tab. The Resource Board, where you will land upon logging in, contains all of the information you need to stay up-to-date at St. Mark's including Class Pages, downloads, forms, and the lunch menu. The latest news stories, photos, and videos from around campus. The master calendar, as well as calendars for your son's school level, athletics, and senior exhibitions. Directories for students, faculty, and parents. To login, click "My Account" above. If you have not logged in before, click "Login Help" at the bottom. Enter the email address we have on file for you, check "Username" and "Password," and you will receive two emails with instructions on logging in. If you need any assistant, please don't hesitate to contact Jan Forrester at 214.346.8225 or Katy Rubarth at 214.346.8806. Each class has its own Class Page, maintained by the respective Grade Representatives. Each page has announcement, dates, downloads, and links specific to each grade level, as well as school-wide resources like order forms and an archive of the monthly Parent Newsletter. To access your son's class page, login to your account, click "Resources," and then click his corresponding page. 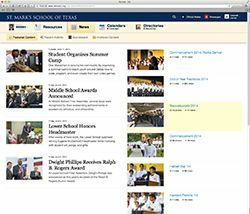 Alternately, you can easily access your son's page by adding his class year behind our web address, such as www.smtexas.org/2015.